San Francisco (THEWILL) - Investigations show Vice President Goodluck Jonathan will officially take over as president anytime from now in a move expected to ease the furor generated by the President's hospitalization. Nigeria's President Umaru Yar'Adua has not been able to perform presidential duties since he was admitted at the King Faisal Hospital in Jeddah, Saudi Arabia almost one month ago. The President left Nigeria on November 23RD for the Saudi hospital without officially handing-in a letter to the heads of the National Assembly, thus making it impossible for the Vice President to fill in for him. However, plans are now being made to get the ailing President to sign a letter formally notifying the legislators of his hospitalization and his unavailability to perform his duties as President. A knowledgeable politician who spoke to us anonymously said “Looks like the President is not going to make it back here soon enough so the Vice President will do his job formally from latest next week. They are putting pressure on Turai to have him send a letter to the National Assembly,” he stated. The leadership of the Peoples Democratic Party and major power brokers in the country seem to have come to a consensus that the President may not be able to continue in office considering the seriousness of his current health. The battle within the various groups in the party has now shifted to who would become the new vice president. Some of the power brokers who are mostly retired top brass in the Nigerian military have had their oil and gas interests threatened by Yar'adua, his men and their favoured Chinese and Russian partners. They have given their blessings to the move to have the Vice President take over powers of the President in order to protect their interests. The politicians being positioned for the VP slot when Goodluck Jonathan becomes president are Jigawa State Governor Sule Lamido, Bauchi State Governor Isa Yuguda, Secretary to the Federal Government Alhaji Mahmud Yayale Ahmed, and Kwara State Governor Bukola Saraki. The urgency to allow Vice President Jonathan become President is to enable him swear in the newly confirmed Chief Justice of the Federation Justice Aloysius Katsina-Alu whose nomination was confirmed last week by the Senate to replace retiring Justice Idris Kutigi who retires at the end of the month, and Justice Ayo Salami as President of the Court of Appeal. There is also the issue of the 2009 Supplementary budget, which requires the President's assent. “The elders have agreed that we cannot allow a constitutional crisis happen. Justice Katsina-Alu and Justice Salami have to be sworn in this year and only a president can do this. So I can assure you that the Vice President will swear them in,” he explained. Last week, a lawyer and activist Mr. Femi Falana filed a suit at a Federal High Court asking the court to compel President Yar'Adua to hand over to Vice President Goodluck Jonathan. He also released a statement over the weekend in a reply to Attorney General Michael Aandooaka's comment that Yar'Adua could rule from anywhere in the world. 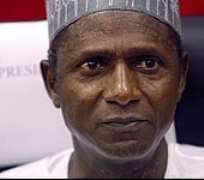 "Last week, the Attorney-General of the Federation, Chief Michael Aondoakaa (SAN), was widely reported to have stated that President Umaru Musa Yar'Adua is permitted by the Constitution to rule Nigeria from Saudi Arabia where he has been receiving treatment for the past four weeks. "One would have ignored the highly misleading statement but for the curious reference to the Constitution of the Federal Republic of Nigeria by the Attorney-General. I wish to state, without any fear of contradiction, there is no law in Nigeria that allows the President to govern the country when he is on medical vacation. For the avoidance of doubt, Section 145 of the Constitution has imposed a duty on the President to transmit a written declaration to the Senate President and the Speaker of the House of Representatives that "he is proceeding on vacation or he is otherwise unable to discharge the functions of his office". "Once such a written declaration is transmitted to the appropriate authorities the powers of the President shall be automatically transferred to the Vice President who shall exercise them as the Acting President of the country. The latter shall continue to discharge the functions of the office until the President transmits another written declaration to the contrary. "It is common knowledge that President Yar'Adua has been receiving treatment in Jeddah, Saudi Arabia, for the past four weeks. As he has been unable to discharge the functions of his office, one would have expected the Attorney General of the Federation to advise the President to comply with the provisions of the Constitution in line with the much-touted rule of law policy of the current Administration. "Instead of provoking an unwarranted constitutional crisis, the members of the Federal Executive Council should, as a matter of urgency, invoke the provision of Section 144 of the Constitution by passing a resolution to the effect that the President is incapable of discharging the functions of his office. This will enable the Senate President to set up a Medical Panel, which will examine the President's health with a view to determining his physical suitability in the circumstances. "Once again, while joining Nigerians to wish the President a quick recovery the Attorney-General of the Federation and other highly placed government officials should desist from turning the Constitution upside down in their desperate bid to cover up the actual state of the President's health." The Movement for the Emancipation of the Niger Delta (MEND) on Saturday struck a major oil pipeline belonging to Chevron and Shell Petroleum and Development Company in protest over the Federal Government's luster attitude towards fulfilling the terms of the amnesty agreement entered with the fighters. The health of the President has been a source of controversy as there has been no further formal communications on his condition from his chief physician Dr. Salisu Banye. Yar'Adua was unable to address a meeting of cabinet ministers via video conferencing as planned last week fueling speculations that comments regarding his recovery are not true.